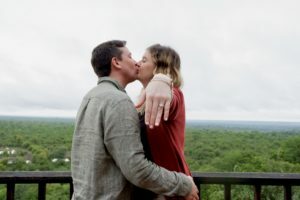 Chloe Reynolds and Chris Byles celebrated their Valentine’s Day engagement at Victoria Falls Safari Lodge, after he’d got down on bended knee in front of one of the Seven Natural Wonders of the World to pop the question. The Valentine’s Day rain did nothing to dampen their spirits, with Chris being determined he wanted to see the Falls on the first day of their holiday, and so the couple set off, ponchos on, umbrella in tow, and struggling to keep their camera dry. “It was incredibly misty and wet, but we stopped off at each point to see if we could get a better glimpse of the tons of water gushing over the Falls,” Chloe says. “Chris kept saying he wanted to set up the tripod and do a little video right at the end on the rocky part of the walk, but after getting the whole way to the end, it was absolutely bucketing down and so we doubled back to a less wet spot to set up the camera. “We had done little holiday videos before and I was expecting the same sort of thing we had done before, but as I pressed record and jogged over to where he was standing he began a little speech,” she says. 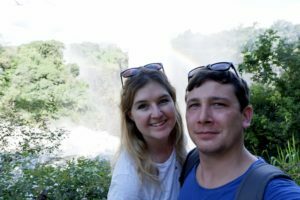 Chris and Chloe, who were staying at Victoria Falls Safari Lodge, decided to rush back there and get into dry clothes so they could celebrate their engagement, which the staff already knew about, so they were greeted with lots of congratulations. “Then there was a parting in the clouds and the rain stopped for our afternoon,” Chloe says. “Looking out over the beautiful view from the Victoria Falls Safari Lodge deck we toasted to our love, and called our family and friends with happy tears to give them all the news. “We also snapped a few photos with our favourite view to remember our special day, and the special place we had it in,” she says. Unbeknown to Chloe, Chris had organised with the staff for a private dinner right at the top of the lodge. “I didn’t even know there was a top level, but if you climb all the way up the beautiful staircase there is a top deck with the most stunning view. Chloe is from Harare, Zimbabwe, but the couple met in London, and live in Northern Ireland. Chloe left Zimbabwe for university in the UK nearly five years ago, and lived for the last 18 months in London, where Chris is from. The young couple would like to move back to Zimbabwe within the next two years. Victoria Falls was a special and magical place to pick for such an occasion, she says. “Chris wanted a romantic, picturesque and impressive location which we would always remember, and he definitely achieved that,” she says. 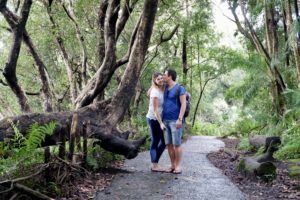 “He knew that I loved Victoria Falls Safari Lodge, and I would never tire of the view and the setting, and now I can remember it as the place where we decided to spend our lives together.